Rooftop solar proves a challenge to keeping prices low on the grid. Solar image from www.shutterstock.com. Australia’s low-cost electricity, thanks to cheap coal, was once a source of substantial competitive advantage. While Australia’s electricity prices are still below the OECD average, the urgent need to reduce greenhouse gas emissions is a major challenge to cheap electricity. In a report released today by CSIRO and Energy Networks Australia, we show that Australia is so far making rocky progress on reducing emissions, maintaining energy security and keeping prices low. But we also show how Australia can regain world leadership, delivering cheap electricity with zero emissions by 2050. A Balanced Scorecard for Australia’s electricity sector in 2016. 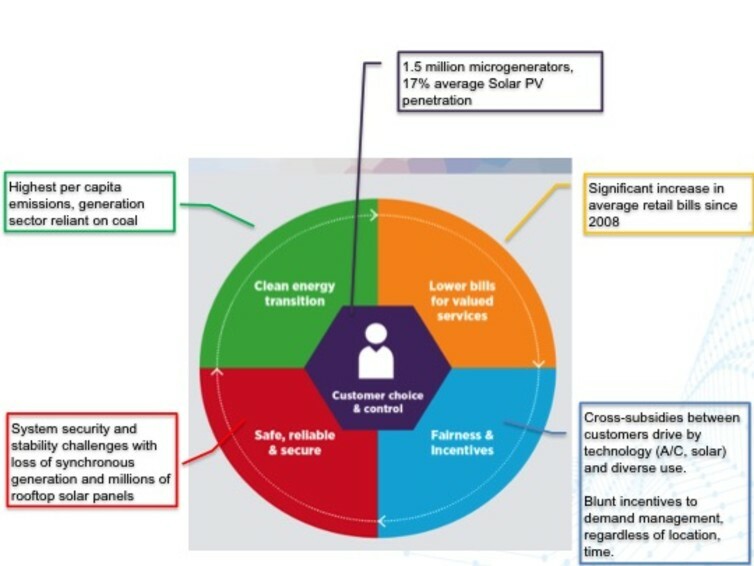 Electricity Network Transformation Roadmap. Australia is the world leader in adopting rooftop solar. Rising retail electricity prices and subsidies have encouraged households to embrace solar with enthusiasm. As a result 17% of Australian households now have solar panels. This can be seen as Australians exercising greater choice about how their electricity is supplied. However, it also highlights some of the problems our electricity network is facing. Retailers sell electricity in Australia by volume (the kilowatt hours and megawatt hours on your electricity bill). This made sense when most households contained a similar set of fairly low-energy appliances. But the rapid increase in high-energy air conditioners and the adoption of rooftop solar mean fees are less suited to each customer’s demand on the system or any services they provide. The are two major opportunities to reduce electricity prices for Australia. First, we need to harness the power of more households producing their own electricity through solar or other distributed sources. In coming decades, households are expected to invest a further A$200 billion in distributed energy sources. We need to avoid duplicating network expenditure (poles and wires) and support balancing supply and demand as the share of renewable electricity increases. But this can be an opportunity if we introduce the right prices and incentives. This means using household devices such as batteries to support the electricity network, and paying customers for this service instead of building more poles and wires. This would require many actions (detailed in the report), including pricing reform, some regulation change, improved information sharing and minimum technology standards. Second, we need to use the existing network more efficiently. Demand has fallen in recent years, chiefly through improvements in energy efficiency and increasing rooftop solar. Because of the reliance on volume-based retail pricing, when consumption falls, networks are forced to increase prices to recover the fixed cost of delivering their services. Conversely, if it were possible to increase demand for grid-supplied electricity without increasing the fixed costs of the system, then network price could be stabilised or reduced. Our research found that electric vehicles offered the greatest opportunity to increase demand for grid-supplied electricity. These have the added benefit of supporting greenhouse gas emission reduction goals. The report recommends that light vehicle emission standards should be pursued as a relatively cheap way of supporting electric vehicles. Appropriate pricing and incentives will also be needed to encourage car owners to charge their vehicles at off-peak times, reducing the need to add more capacity to the network. Residential electricity bills will need to increase gradually over time in all countries due to the cost of decarbonising electricity supply. Australia’s goal should be to be the most efficient at achieving that. Relative to taking no action on these issues, CSIRO estimates that the measures described above will together reduce the average residential electricity bill by A$414 per year by 2050. Projected savings in average residential bills (in real terms) Electricity Network Transformation Roadmap. Those savings are funded through reduced network spending and customers needing to spend less on their own distributed energy devices (to avoid higher bills or go off grid). These savings add up to A$101 billion by 2050. Cumulative electricity system total expenditure to 2050 (in real terms) compared with the counterfactual (business as usual). Electricity Network Transformation Roadmap. At the same time, customers have more choice to participate in providing services to the grid, are receiving fairer payments for doing so, and the electricity system is using distributed energy resources to balance the system. All of these will help reduce greenhouse gas emissions from the electricity sector to zero by 2050. On a slightly different angle can I ask if the CSIRO has done any work on wave generation of electricity. I think (probably simplistically ) of the huge tides that could drive a generator at our harbour entrances,( e.g. in Victoria, NT, Qld and WA that could generate on both the in and out cycle of the tide. It would not depend on the sun or wind. Just a thought. This is so weird. The CSIRO seem to have confused the welfare of the electricity utilities with the welfare of the community. Can I gently say my friends, they are not the same. We do not have to step in to protect the electricity utilities by generating more demand. We can let them wither as we move to more efficient solutions. This will be very expensive and painful for the utilities and their funding for the CSIRO, but not for the rest of us. Moving away from ‘volume based pricing’ means charging for access regardless of how much electricity you use. That is a good way to charge low income households a fortune for access and to subsidise and encourage high consumption, it is also an excellent way to discourage householders from investing in alternative energy sources as they are up for the high access charge regardless. This would be a really good thing for electricity utilities, really bad for the community. The argument seems to be that if people buy high energy air conditioners and use a lot more power, or if they use much less power because they have solar panels, we should stop charging them for how much electricity they use?!? The distribution and transmission networks are deemed natural monopolies since the service they deliver cannot be delivered more efficiently by multiple entities. As natural monopolies they are subject to significant regulation. An important part of that regulation is that their rate of return on investment is controlled. In return for accepting this controlled rate of return they are provided a fairly strong guarantee that they will get a return on their past investments and any new investment plans are closely scrutinised. Consequently if those existing assets become under utilised it does become our problem as a community – not just a problem for the networks. Under existing regulation, if demand falls networks are allowed to increase their prices to recover enough revenue to achieve their regulated rate of return. I would also not jump to conclusions that changing the regulations solves the problem either. In regard to your points about pricing, the starting point for this conversation should be that we all need to be more aware that it is not just the volume of electricity that matters to electricity costs. Your instantaneous demand for power is also an important driver. It is in fact the main driver for distribution and transmission costs. If we only charge people for their volume then we are not reflecting to true cost of delivering electricity supply. It means that people with high power drawing devices, such as air conditioners are likely being subsidised by people without those devices. Besides fairness, continued volume-only pricing also means that no one has any incentive to manage their power demand. Our modelling finds that if we do provide more incentives for households to manage their power demand then in the long run costs will be relatively lower for all customers, regardless of their volume of electricity use. This is because it provides incentives for households to provide demand management services back to the grid (which households are paid for) and thereby reduces the capacity that networks have to build to meet demand. How much better it would be if the CSIRO was not shackled to the coal industry. The money needlessly wasted on developing “clean” coal (an oxymoron?) an then to give us hope for the future. Can we believe the writing from the CSIRO any more? There is another part to this conversation and that is refining the devices that require power. It is hard to reconcile the slow development of many household equipment that has hardly progressed in design over the last 50 years. Take for example a toasters, ovens and element heaters. There is much we could do to make these more energy efficient if it was mandated by either legislation or higher electrical energy prices. There are plenty of jobs that could be created if as a nation we were able to encourage development of industries that focus on energy efficient household appliances.